This 15 year old patient has a history of trauma to #8. 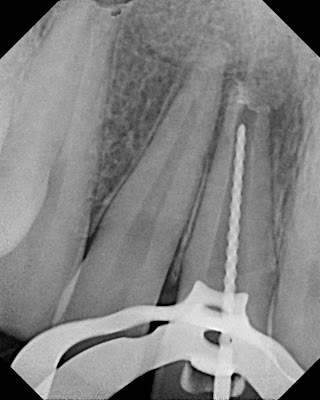 Trauma occurred at an age before apical closure occurred. 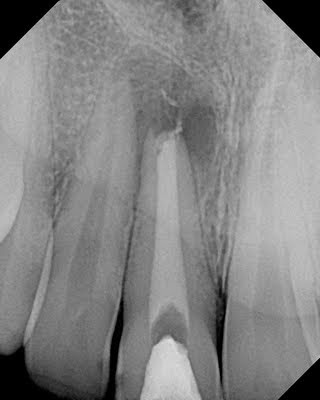 Tooth was diagnosed with necrotic pulp and symptomatic apical periodontitis. Note the large periapical lesion. Traditional apexification using Ca(OH)2 was used. 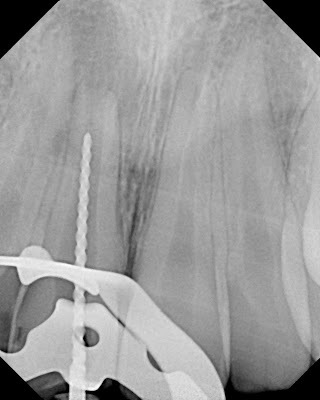 Tooth debrided to the apex, NaOCl irrigation. 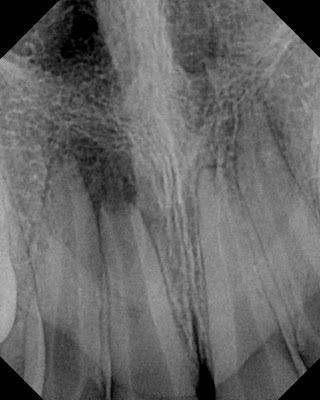 3 month check shows resorption of Ca(OH)2, but apex still open. Apical lesion almost completely healed. 10 month re-evaluation. Apical barrier present, so it was time to obturate. This is a great view of the apical barrier that has formed. Tooth was obturated with MTA. 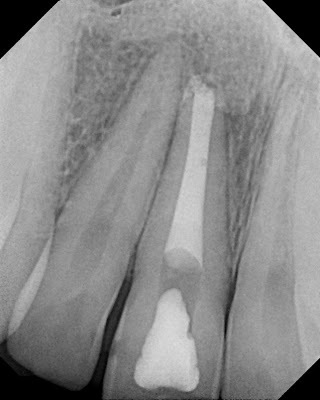 If this tooth ever needs apical treatment, a simple resection will be done without retropreparation or retrofilling. I just found your blog tonight and have found it very informative and interesting. Why was CaOH placed the second time? Even if there was no apical barrier, can you not simply place MTA and obturate. The MTA would continue the process of apexification, wouldn't it? Yes, CaOH was placed a second time. You could simply place MTA, however with a large open apex, it is more difficult to control the MTA at the apex. The MTA was much easier to place with that little calcific barrier in place. Just looking for some input. 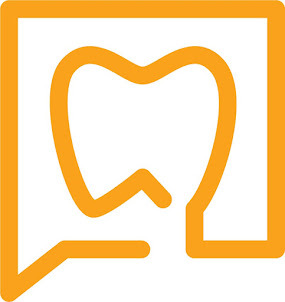 My husband went to the dentist today, and he told him because his bite is funny due to a locked tooth in the bite, his teeth have weakened and cracked. He took intra-oral photos to show my husband. He also blamed amalgam fillings. He wants to pull all the amalgam out and put in composite for $2000. Does this make any sense? I'm concerned....and would love just an unbiased opinion. I live in a small town where a good dentist is very hard to find! I was a dental assistant 20 years ago and we never would have done this then. WIth MTA needing moisture to set, how deep will the MTA set? Did you place a moist cotton pellet at the coronal most aspect? 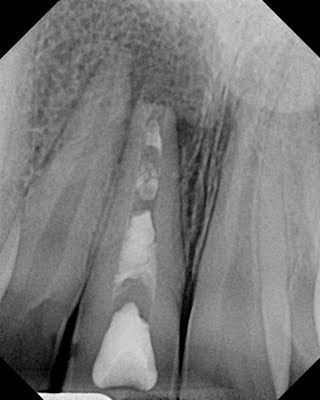 I've also seen MTA placed only at the apical 4mm with the rest of the canal backfilled with gutta percha and sealer after the MTA set. What is the advantage of a full MTA fill? I did place a wet cotton pellet over the MTA fill. No post was needed, so MTA was used to obturate the canal. 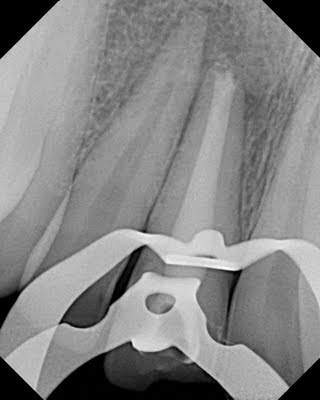 I think MTA provides a good coronal seal as well as apical. However, you could obturate the coronal portion with gutta percha as well. Thanks for the prompt update. With an MTA obturation, will the water in the wet cotton pellet percolate all the way through the MTA (it looks like 10mm or so from your film) to the apex? Thanks again.